Peoplestown is a neighborhood of Atlanta just south of Georgia State Stadium and Downtown Atlanta. the Downtown Connector (I-75/I-85) and railroad tracks on the west, across which is the Pittsburgh neighborhood. It is part of NPU V.
1890 ad for Washington Heights subdivision along Washington, south of Ormond Street. In 1885, the Atlanta Electric Railway built a line along Capitol Avenue, and construction of housing began in what is now Peoplestown. The neighborhood is named for the Peoples family, who owned land there. The neighborhood developed white, integrated, and black sections. The white sections were mostly on the west of Peoplestown, and the all-black sections mostly on the east side. In addition, many black residents lived in detached units at the back of white lots. One of Atlanta's most fashionable residential streets in the 1890s was Washington Street, running from the state capitol through the Washington-Rawson district to what is now Peoplestown. Newspaper ads in the 1890s promoted "Washington Heights" along Washington south of Ormond, now part of Peoplestown. In the 1930s, the black areas started to receive utilities. In the 1920s and 1930s, the area became less attractive to affluent whites who could afford automobiles, which allowed them to live in the more desirable northside neighborhoods and still commute to their downtown jobs, though the 1960 census still showed a neighborhood that was about half white and half black. The construction of the Downtown Connector in the 1960s required the teardown of some houses on the western side of Peoplestown. 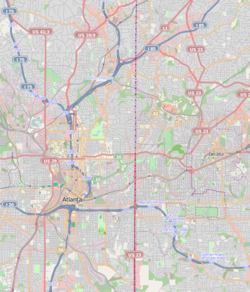 Additional houses were torn down in the mid-1980s when the Connector was widened, as a result of the defeat of I-485 by intown neighborhoods such as Virginia-Highland and Inman Park. In the 1990s, revitalization efforts coalesced into the Peoplestown Revitalization Corporation which has set up a neighborhood watch program and other safety programs. A redevelopment plan for Peoplestown was drawn up in 1996. D. H. Stanton Park. This park has been renovated as part of the development of the BeltLine, on which it is located.